If you’re looking to find out how you can get to Kelantan province, read on and find out what your options are. If you want to get to Kelantan via airplane you can use the airport called Sultan Ismail Petra (which has the KBR designation), found at Pengkalan Chepa, near Kota Bharu. 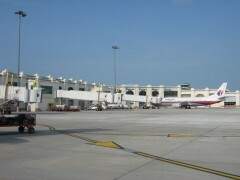 The airlines which are using this airport are Air Asia and Malaysia Airlines, both flying to this province from the city of Kuala Lumpur. You can also get here from Penang, by using FireFly. If you want to get to Kelantan by using the roads, you can get to it by using the East West Highway. This road takes you from Gerik to Jeli, which is in Kelantan. Another road is Federal Route 8, which takes you from Kota Bharu to Central Pahang, by going through Gua Musang and Kuala Krai. Finally, you can get to Kelantan by using the Federal Route 3, going from Johor Bahru to Terengganu and finally to Kota Bharu. This last road should be used if you want to get to Perhentian Islands. If you’re coming from Thailand you can get to Kelantan starting from the Narathiwat province. The capital of the province is connected with the rest of Malaysia by express buses for long distances, going to Penang and with a number of other towns from the East Coast (Kuantan and Kuala Terengganu). There is a bus which runs twice each day between Kuala Lipis and Gua Musang, the latter being a town in Kelantan and the former one in Pahang. The province of Kelantan links to the other parts of Malaysia with the help of the railway from the East coast. The name of this railway line is Jungle Railway and it begins from the state’s northern area, going through Wakaf Baru, then through Kuala Krai, Gua Musang and then it goes into Pahang. The express trains will stop at the stations called Gua Musang, Pasir Mas, Tumpat and Wakaf Bahru. If you want to get to Kelantan from Kuala Lumpur you can take the Ekspres Wau, a sleeper train which links Kuala Lumpur to Tumpat, while going through Jerantut. There is also a sleeper train which you can use to get from Singapore to Kelantan each day, with a stop at Jerantut. There are vehicular ferries and passenger boats which go over the Golok River, between Ban Taba from Narathiwat Province and Pengkalan Kubur, which is in the vicinity of Kota Bharu.